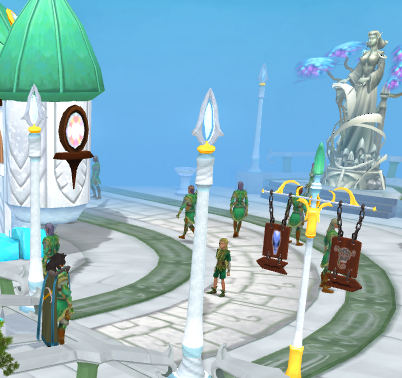 Ten years from its mysterious release, the Elf City of Prifddinas is now accessible to players who have completed the Plague's End quest. 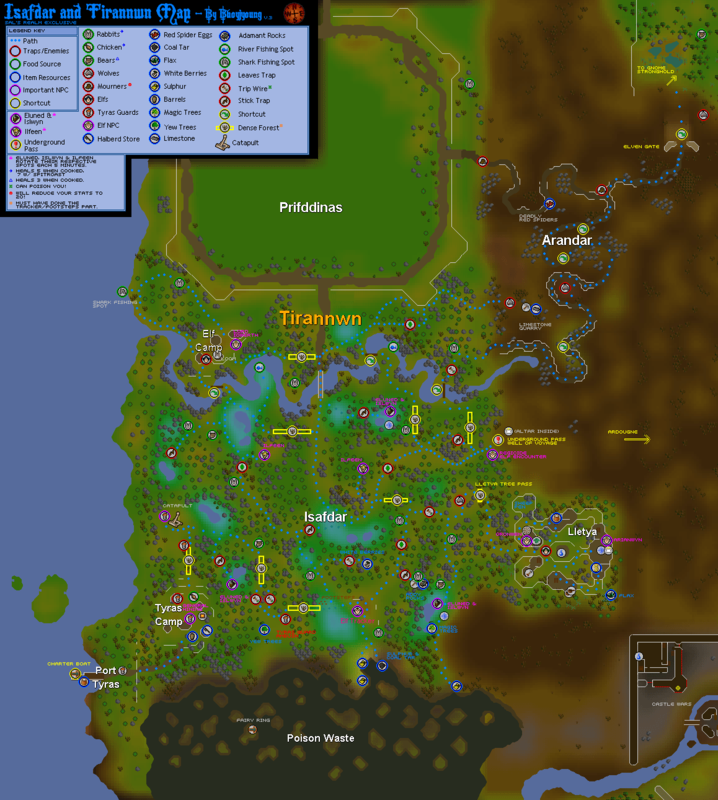 In the far western part of the map, its crystal walls and nine shining towers glimmer in the kingdom of Tirannwn. For ages, the Iorwerth clan had taken control of the city and forced out the other seven clans while sealing the city off from any outsiders. Only now, after reverting to a seed, had the Iorwerth learned to live in harmony with the other clans and the city had been revived. 5. Solomon's Store and Xuan-Style Loyalty Store. 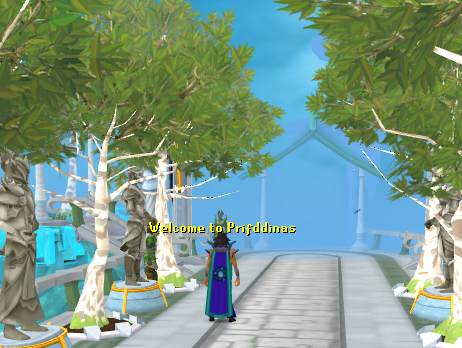 Getting to Prifddinas can indeed be a painful trek without teleports, but there are luckily many ways to reach this city without having to go through the forest of Isafdar. If you ever have to walk though, this map of the elf territories will lead you through the various traps and dangers you may face. 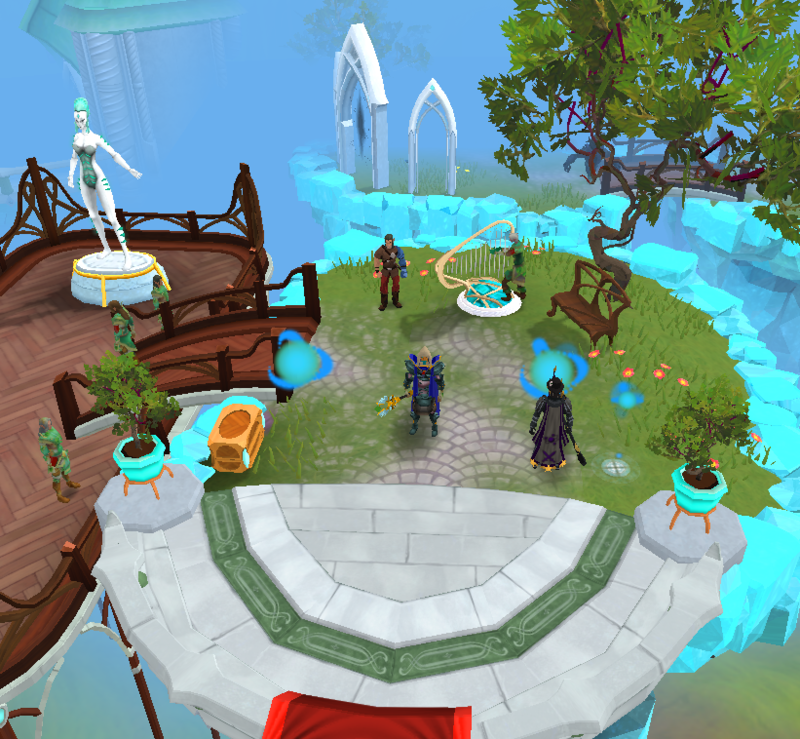 If you have unlocked the Prifddinas Lodestone location, simply teleport there and you will be brought to the Tower of Voices. If not, the Tirannwn lodestone south of the walls is another option. This method involves using the Elf Crystal to teleport to the clan of your choosing by tuning the crystal toward whatever clan you select. Using the Spirit Tree network, you can gain access to the east side of the city to the Crwys Clan. 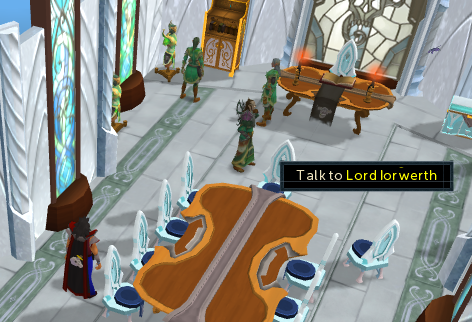 The Gnome Glider system will enable you to access to the Meilyr Clan. Using the Fairy Ring network and entering the code DJS will bring you to the west side of the city at the Amlodd Clan. Players who have their Player-Owned House situated in the Elf City have the ability to teleport to their house or outside the portal. Moving to Prifddinas will cost 1,000,000 gp. If you don't mind the hike, teleporting to Lletya, the Tirannwn lodestone, or walking through the Arandar Pass can give you access to either the south or east entrances respectively. Refer to the map at the beginning of this section to guide you through the challenging forest. Upon approaching the gates, you will find two guards whom you will click on to pass. 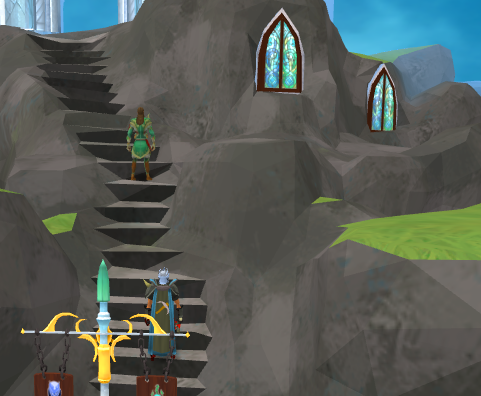 Walking up the hill, you will come across a Prifddinas monument dedicated to the gates that once protected the lost city. Continue along the ridge and find yourself within the city. In the center of the city, you will find an enormous tower made of crystal, similar to the walls of the city. The function of this tower is to enable the Elf clans to communicate with their goddess, Seren. In the upper levels, you will actually find a fragment of the goddess herself. From the tower, you will have access to four cardinal directions. The symbols of each clan are indicated by stained-glass markings on the floor. 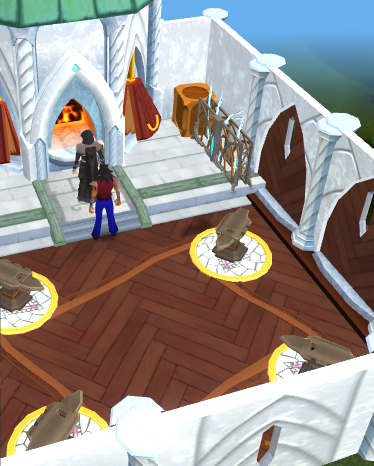 A small Grand Exchange can be found in the ground floor of the tower. 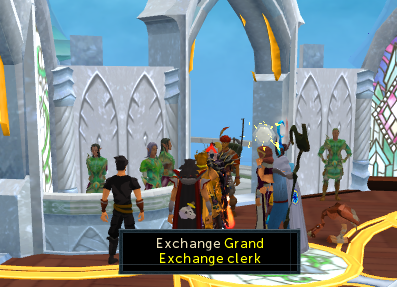 This functions the same way as the Varrock location except it is smaller, containing only two bankers and one exchange clerk. 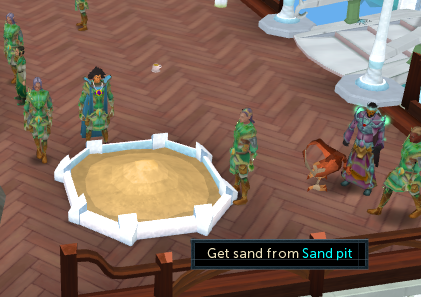 You are given the option of teleporting to the Varrock Grand Exchange from here. A Herblore decanter, Rhobert Dail, is also present a few steps southwest of the booth. This Quartermaster functions just like Mistress Fara in Burthorpe. You will be able to toggle and cash in on daily challenges. An ever-glowing bonfire allows you to do whatever you would on any other bonfire, but this one is not so ordinary. 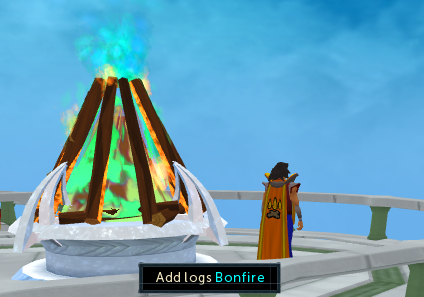 This one has the chance of generating a fire sprite and offers the random chance of keeping a log during Firemaking. Solomon's Store can be found in the southwest portion of the tower. This section in the northeast of the tower offers a few useful teleports. This portal allows access to the Sinkholes distraction and diversion via right click, or to Daemonheim for Dungeoneering with a left click. Teleportation to your Clan Citadel will also be possible from this area. 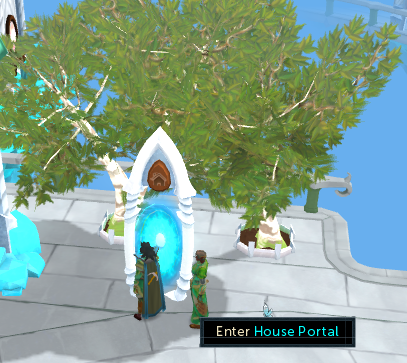 Your Clan Vexillum will have the option of taking you to the Prifddinas portal. Players who have level 94 Farming are able to obtain a rare crystal acorn obtained exclusively from either Prifddinas or trading other with players. This can be planted in the patch and the result is a crystal blossom which can be harvested once per day. The blossom will not always be visible, so it is helpful for you to communicate with players in other worlds to find the time where a blossom may be harvested. This will generate substantial experience in Farming and 50,000 experience for the first time planting. 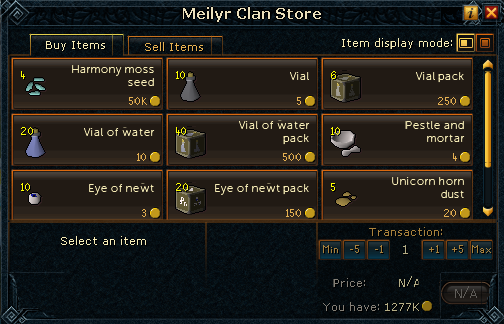 The Meilyr Clan, specializing in Herblore, have a use for such a blossom in one of their high-leveled combination potions. 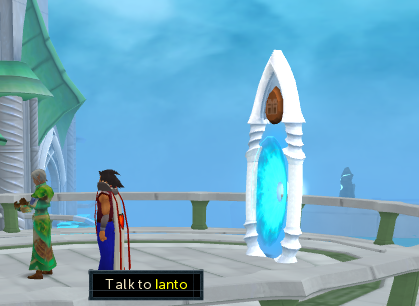 Ianto in the southwest room acts similarly to Diango in Draynor. You may retrieve holiday items from him, buy various toys, or use the portal behind him to access any holiday event that may currently be happening. There are 16 skills which can be focused on in the city. For each of these, you have the chance of receiving a golden rock similar to the strange rocks found in the Shattered Heart Statue distraction and diversion. Two golden rocks from each skill are required and it is the same random chance of receiving them as the strange rocks. They do not have to be acquired in Prifddinas, but you must speak with Auron Ithell to start collecting them. Adding each golden rock to the statue rewards more experience than with strange rocks and the statue of Dahmaroc. After 32 times of completing the statue, the Elf will tell you how she was transformed into a statue. The staircase located in the northeast will take you up the tower. 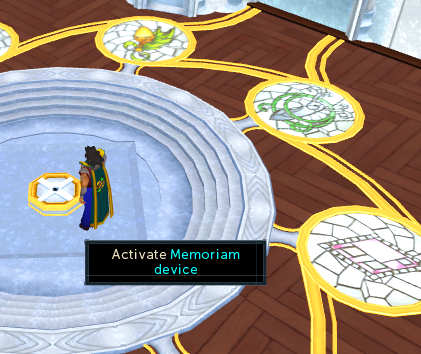 On the second floor, there is a Memoriam Device which can be activated to replay crystal memories that you have found. Over the Iorwerth symbol south of the device, you will see a fragment of the goddess Seren herself. What city would be complete without plenty of lore to pick up? 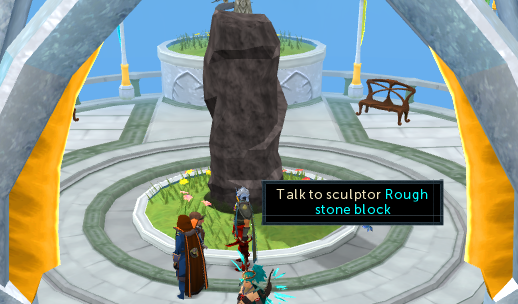 To find out more on Seren and her time spend with the Elves, Guthix, or information on each clan, there are multiple crystals that can be found around the city. Each clan area holds two. Memoriam Readers in the Tower of Voices will give you a lore fragment for each. One of these crystals will be available in each clan in plain sight for you to find. The other will not be so easy. You may be required to do a small task for the second lore crystal. At the end of each clan section, there will be a segment explaining how to locate the crystals in each city. In total, there are eight Elven clans. Each of these clans has their own place in Prifddinas where they practice their respective skill or lifestyle. Additionally, each clan area possesses its own small tower and one large tower of voices which can communicate to the main tower in the center of the city. You are able to climb the large tower and ring a crystal chime that other players can hear if they are on the Tower Chime of another tower. Players on each tower can actually create songs by ringing the chimes. Activities and alternative training methods can be found at each clan area corresponding to the skills of their mastery. Each clan has their own color and symbol which is represented by their clothing and buildings. A Clan Noble is also present in each clan. You may talk to them for information on what the clan represents. The Amlodd Clan is skilled in the Divination and Summoning arts. You may reach this area by using Fairy Ring code DJS to appear on the west side of the town. In the center, you will find a Summoning obelisk and multiple NPCs to interact with, including Lord Amlodd himself. If you have level 88 Summoning and participate in cleansing the dark cores, or by doing other various activities within the city, you are able to receive Light Cores. 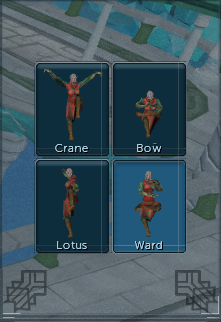 These are a secondary ingredient for Light Creature familiars similar to the ones floating around by the Tears of Guthix minigame in the caves underneath Lumbridge. Energies and enriched energies may automatically be turned into Divination experience when harvesting from wisps by using these Light Creatures. You can also use them as a light source, teleport to the Tears of Guthix minigame, remove the effects of drinking the green tears, and also to extend your time in the cave. 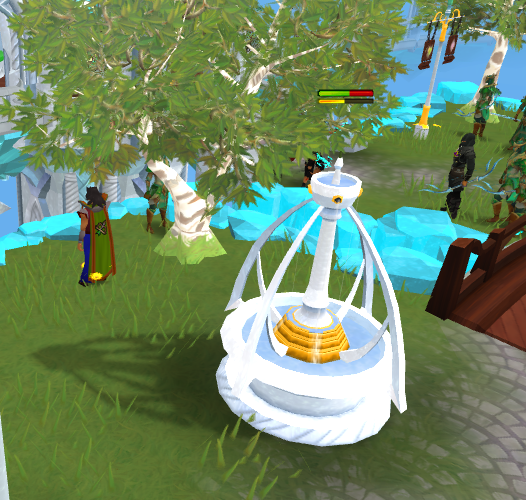 The Hefin Clan has an agility course where you will be able to use the Light Creature's scroll ability to aid you. 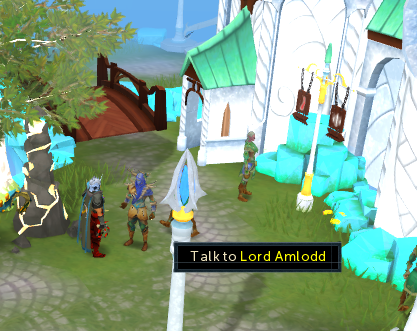 Lord Amlodd in the center of the clan area will give you 70% of the shards you need to summon a Light Creature. He will sell you Summoning supplies and offer a teleport to the Familiarisation minigame. 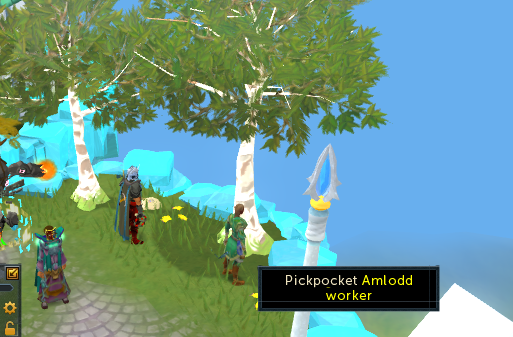 Amlodd Workers wandering around the middle ring of the clan area can be pickpocketed if you have level 96 Thieving. They may award you with Divination energies, summoning charms, charm slices, portents, and signs. Rarer potential loot include full pouches and higher leveled portents and signs. 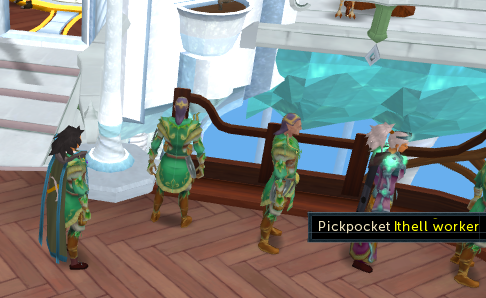 If you fail at pickpocketing 3 times within the clan area, they will be aware of your actions and you will not be able to pickpocket from the Amlodd for a short time. 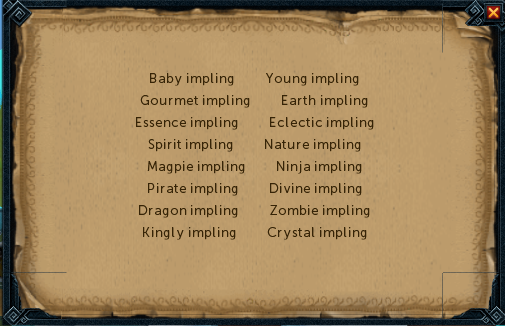 The Impling collector, Daffyd, is an elf who will give you a scroll and ask you to compile a list of the implings you may collect around Gielinor. This will require you to catch every type of Impling barehanded. This will include Crystal Implings. Implings caught in either the world or Puro Puro will count. Upon completion of the scroll, you will be awarded the ability of receiving double experience from catching implings barehanded. Jarring implings do not count. Completing this will also award you with a generous amount of Hunter experience and a free teleport to Puro-Puro. This counts as a requirement toward the Completionist Cape. To the west of the area, there is a large staircase for you to ascend and find Copernicus Glyph. This is a Distraction and Diversion where you will need to sculpt the correct statue corresponding to the area you are in. 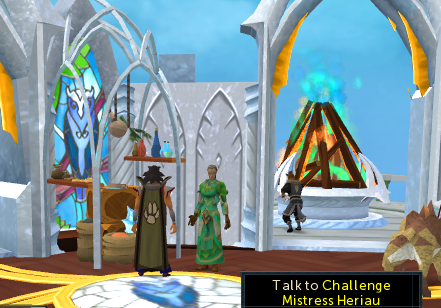 For example, since we are in Prifddinas, the appropriate statue is one relating to Seren. You first build the scaffold. The sculptor will off you some advice during this stage on how to design it. You and the sculptor will begin work on the statue, and you will be offered generous experience. This process can be repeated once a month. 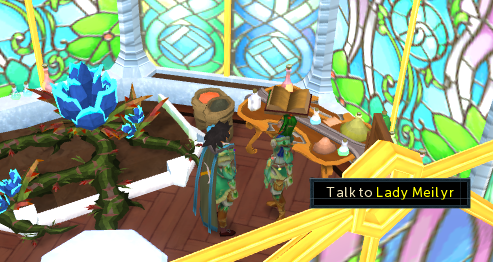 Crystal Locations: One is inside Daffyd's house, and the other is received when you teleport to the Fairy Ring DJS. The Cadarn Clan are skilled in Magic and Ranged combat. When the Iorwerth Clan attacked, the Cadarn Clan took up the responsibility of protecting the citizens. It is led by Lord Cadarn. This section contains a flax field, spinning wheel, and a loom. 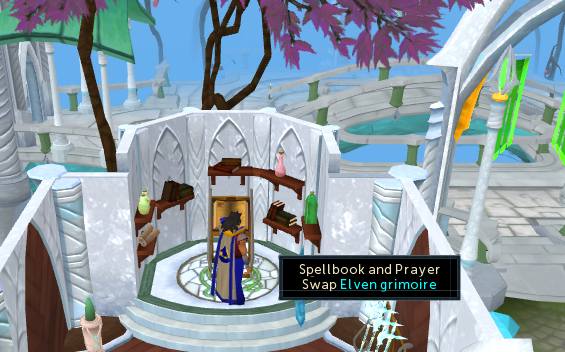 The fountain in the picture below is the Tears of Seren fountain where you can recharge Dragonstone jewellery, such as your Amulet of Glory. 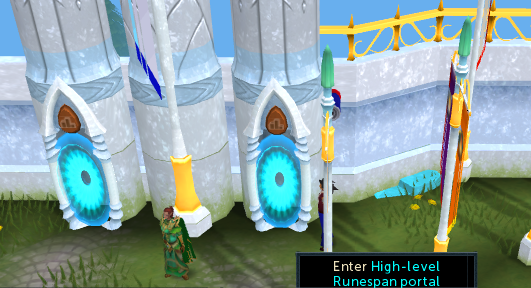 The Max Guild run by Maygan (enemy of Max in Varrock) is accessible to players with 99 in any skill or a quest point cape but all skills level 99 to actually enter. Here, players can buy any skillcape in the game including the Max Cape for their usual prices or just spend time in the garden. 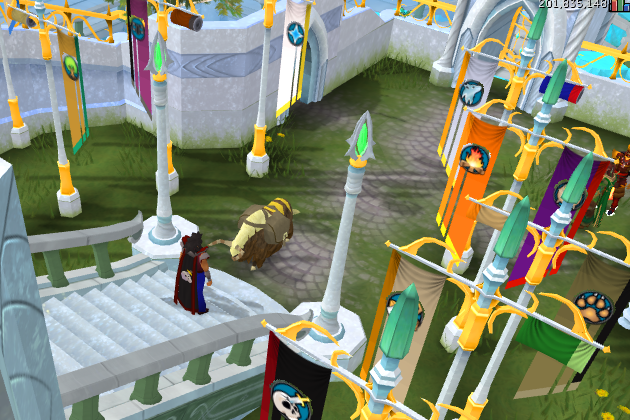 Twenty seven poles surround this area corresponding to the number of skills in the game. You are able to unfurl a flag to whatever skill pole you have achieved level 99 in, visible only to you! There are skill portals in the garden as well. You can direct these to various high-leveled skilling locations. You will however need at least 15 level 99s to tune the second portal. The first tune for each portal is free. Afterward, there is a cost of 100,000 coins, dropping to 50,000 with every five maxed skills you possess. 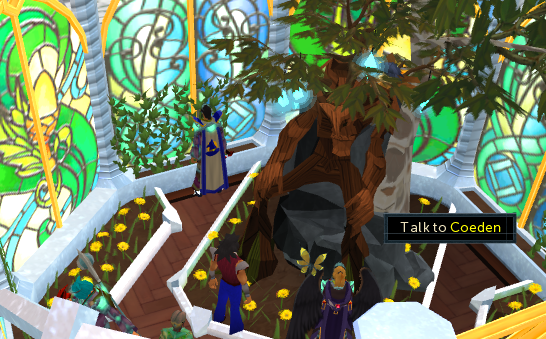 If you can enter the Max Guild, you will be greeted by an elf who acts as a challenge quartermaster and will reward you with a Crystal Tree. 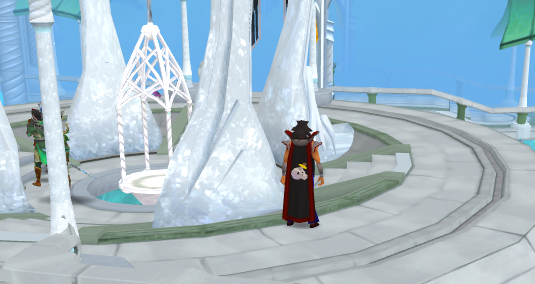 Access to the Max Guild can be granted by operating the Completionist Cape. In fact, you will also be able to buy a Completionist Cape from here for the normal price of 5,000,000 gp. 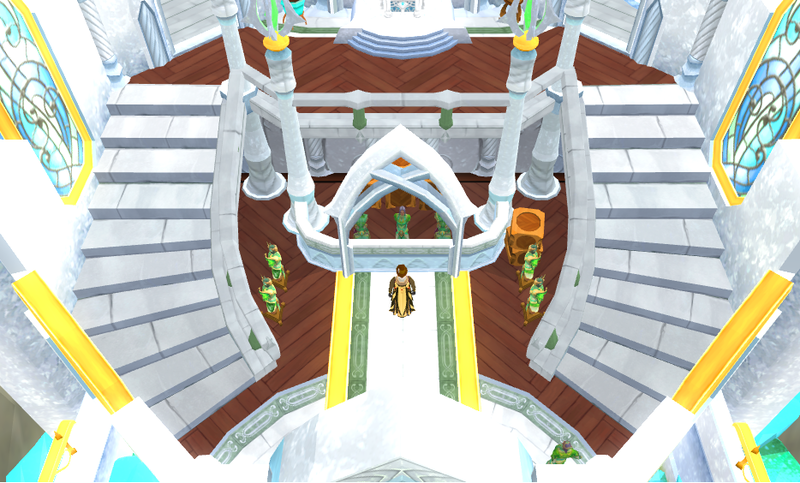 The inside of this guild is for maxed players to socialize and to log their activity and access a bank. 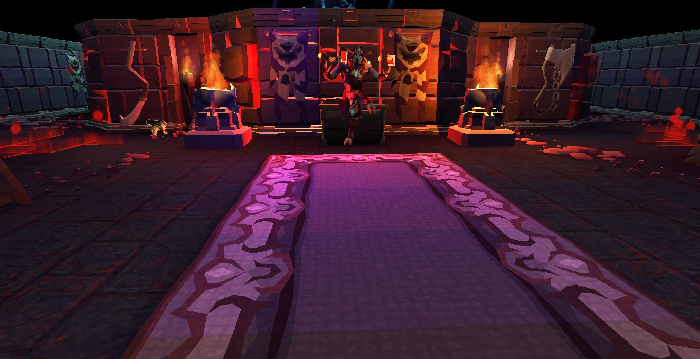 The portal in the Max Guild can be programmed to access various bossing locations such as the Dagannoth Kings, Kalphite Queen and King, God Wars Dungeon, King and Queen Black Dragons, Vorago, The Mole, and Corporeal Beast. If you have pieced together the entire Elven Shattered Heart statue, you can find the resulting NPC here. If you have received a Completionist or Trimmed Completionist cape, you will be able to sit on the throne in the back of the guild. 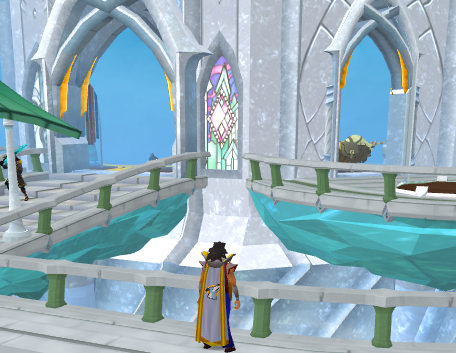 Only one player may sit on the throne at a time and it will boost all skills to 100, 121 for Dungeoneering. This house in the west portion of the clan contains an Elven Grimoire, an area that allows you to swap from your normal magic spellbook to Ancient Magicks and vice versa or from prayers to ancient curses and vice versa. Doing this can also recharge your prayer points and offer boosts in Defence, Ranged, and Magic. An elf named Haf who owns a battlestaff shop can be found wandering inside or near the outside of this house. Players with at least level 93 Thieving will be able to pickpocket Cadarn Workers to obtain seeds, bolts, arrows, runes, food items, or a rare chance of crystal items. 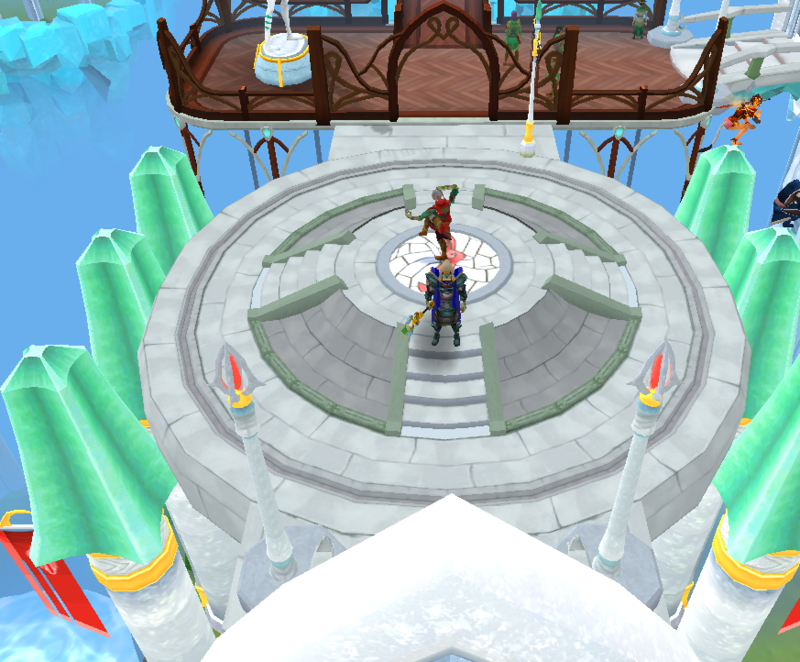 Level 122 Cadarn Ranged Warriors and Cadarn Magicians are present in the center of this area. Crystal Locations: You may receive one by pickpocketing Arianwyn and another is inside the building with the battlestaff salesman. Crwys Clan members are skilled in Woodcutting and Farming and led by Lord Crwys. The trees in this section are not small and grow very different from what you are used to seeing. In fact, they extend deep into the crater. 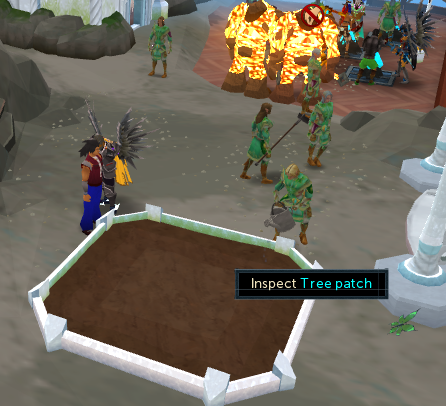 Here you will find 8 spots of Choking Ivy, 2 Yew and 4 Magic trees. This area comes complete with a bank chest and a farming patch for herbs. Crwys Workers walking around the area can be pickpocketed if you have 97 Thieving and they will reward you with logs, seeds, compost, farming potions, and farming amulets. You may have the chance of receiving bird's nests and geodes from either pickpocketing or cutting the trees. 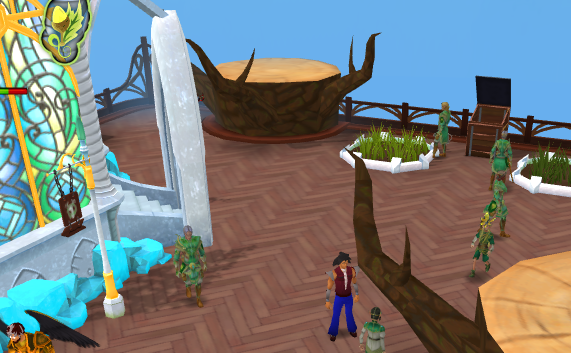 Geodes are tiny crystal structures that can be found while chopping Crystal Trees at level 94 Woodcutting, but in this case all trees in the Crwys section may drop them. They can be shattered for various gems, Crystal Seeds, or Crystal Triskelion fragments. 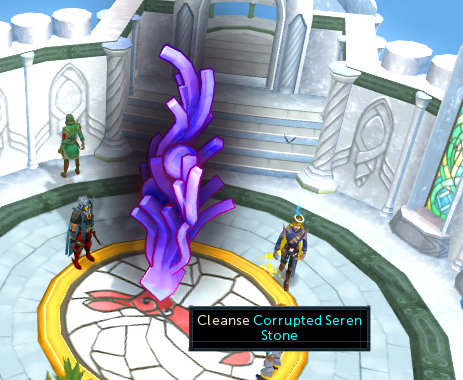 The Voice of Seren effect will increase the chances of obtaining a crystal geode. Between the two giant Yew trees pictures above, there is a bush patch and a herb patch. The large house in the southwest end of this platform is the home of Coeden, a large tree figure who owns a seed shop where you can also buy various planted tree and fruit tree saplings. You may also chop ivy along the walls of this house. You will find two tree patches in the outer circle. 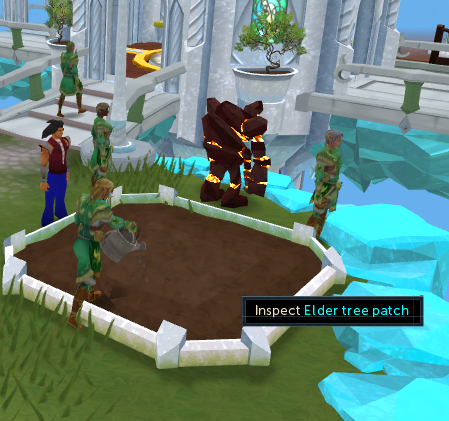 One is an Elder Tree Farming patch which can be planted if you have at least 90 Farming. They are rare loot from pickpocketing, bird's nests, evil trees, or monsters on the rare drop table. A sapling must first be grown in a pot and then planted in the patch. Every 5 minutes of continuous chopping, the tree will die for a short while of around 10 minutes. 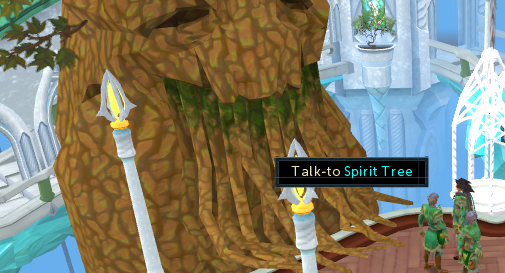 A Spirit Tree patch is also available, giving players with 83 Farming (boosts possible) the option of having 3 Spirit Trees grown at the same time. You must have completed Prisoner of Glouphrie and have talked to the gnome guarding the patch first. 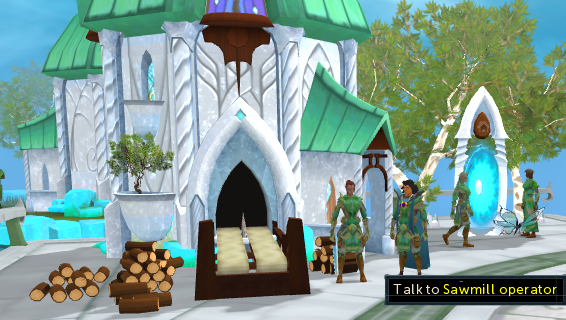 The Dark Gnome will also provide you with information on the clan's relationship to the Iorwerth and how they had to adapt to the changed environment. This branch of the Spirit Tree network can be found to the east in the Crwys Clan. Crystal Locations: One is received from planting a bush in the bush patch and checking its health, and the second is southwest of the Elder Tree patch. The Hefin are skilled in Prayer and Agility. Heading north from the middle ring of this clan, you will find a chapel on a mountain housing an altar to Seren and a strand of Corrupted Seren Stone. At the base of the mountain, you will find Hefin Workers which may be looted with level 96 Thieving for items including bones, prayer or agility potions, and the rarer higher leveled bones and potions. The chapel mentioned earlier, upon closer examination, is actually a cathedral dedicated to Seren and made from one of the fully mined Seren Stones from the Trahaearn Clan section. The only problem is that the poison wastes to the south have infected the cathedral with black ooze. Buying cleansing crystals from the Hefin Clan will allow you to start a cleansing ritual which will generate Prayer experience. This requires level 75 Prayer. 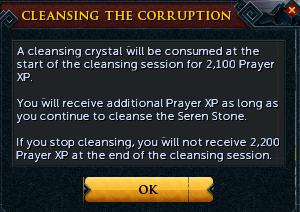 Purchasing a cleansing crystal costs 130,000 gp from one of the monks in the Hefin Clan. 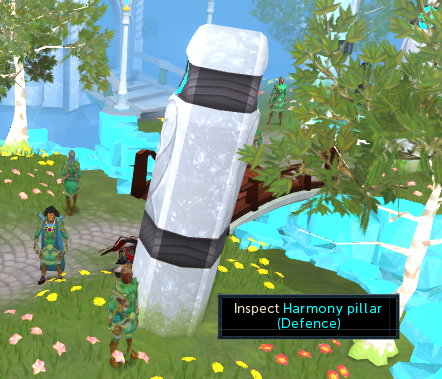 If you have level 75 Agility, you are able to balance upon serenity posts located across from the agility course for a daily dose of bonus Agility experience. When you balance on the post, you will be given instructions by Lady Hefin as to what pose you should be doing. The experience is gained for every second you do the correct pose. Much smaller experience is awarded for the incorrect pose. When the timer at the top is filled, you will receive a message that you have received the maximum amount of experience on that day. Some poses may change more quickly than others, so it is important to pay attention. This clan comes complete with an Agility course, accessible starting at level 77 Agility. This is both the starting point and finish line. Completing all of these shortcuts beginning and ending at the Hefin Clan creates a course. 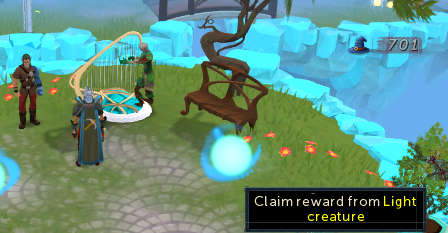 Light Creatures will appear after completion of each lap awarding you with Agility experience with a nearby musician to help replenish some much needed energy. Every 5 Agility levels will yield an increase in that experience. Other rewards include experience multipliers, light cores, crystal tree acorns, and Prayer or Agility experience lamps. A talent scout will also be waiting and watching your performance in the course, waiting to take you into The Pit Distraction and Diversion. There is a timer for you to record your speed, and a velocity bar which increases as you keep moving. Crystal Locations: One is found inside of the cathedral. 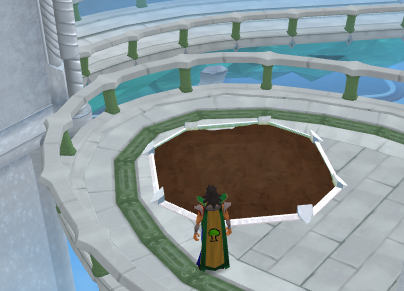 The second is found if you use one of the agility course emotes near the serenity posts. Being the powerful military force that eventually led to seizing control of the city, the infamous Iorwerth clan is skilled in Melee styled combat and Slayer. 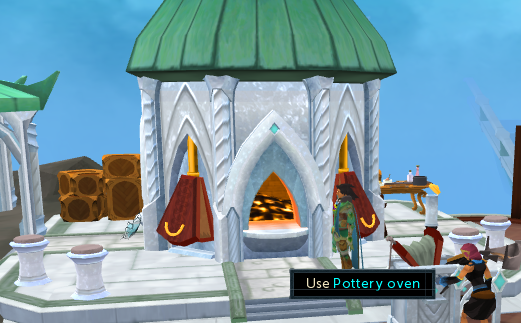 This is the area where you can find the highest level slayer master, Morvran. Also in this area, you will find a crystal chest with a much better reward potential than the one in Taverly. A mini-obelisk can be used to recharge your Summoning points, and an altar for Prayer. Players who have at least level 85 Slayer and 120 Combat will be able to receive a task from Morvran. You can find him walking around the cage in the above picture. 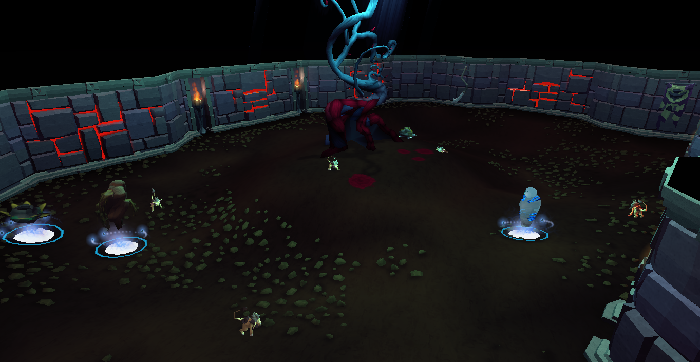 The monsters given by both Morvran and Kuradal are almost the same, but Jagex had removed the most cancelled assignments from Morvran and added monsters available in the Elf City's slayer dungeon. Another difference is the amount of kills given by Morvran which is roughly 20% more per task. While fighting these bosses, you will obtain dark crystals which act as combat inhibitors. These crystals do not only take up an inventory slot, but they also give you a handicap. Handicaps may include monsters taking reduced damage from a certain combat style or increased damage on you by certain attacks. You are able to decide if you want to take them or not, but a large Slayer experience reward is given to those who accumulate more and more dark crystals. If you choose to abandon the crystals, you will still be rewarded with generous Slayer experience. 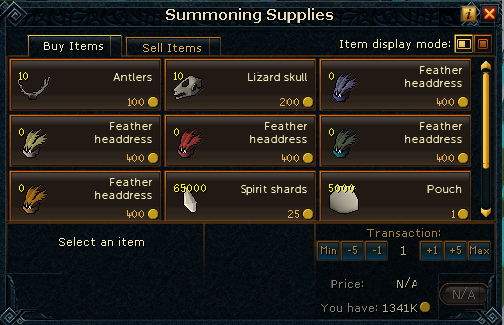 All Slayer masters have additional Slayer rewards available for purchase. You can purchase preferred assignments which grant a greater chance of you having a particular monster you enjoy Slaying. If you have access to the Elf City and want to upgrade your Ferocious Ring, you can do so and change your teleport to Morvran instead of Kuradal with the same bonuses in the Elf City slayer dungeon. Finally, if you wish to extend the amount of monsters you are assigned by 20%, you can do so once per task BEFORE you have started the task! If you have at least level 90 Slayer, you will be able to participate in this activity for 10 minutes on a weekly basis. You will be given miniature flash assignments to kill as many monsters and complete as many assignments as possible. Each assignment includes five monsters of a certain level and quickness to kill. It will always be a pattern of Tier 4 monster, Tier 3, Tier 2, and then Tier 1 starting over again at Tier 4. For example, you start with five quick creatures, five medium ones, and then five slow ones, starting over with five quick creatures. The experience you obtain will depend on how many tasks you were able to complete. If you need a bank chest or to recharge your summoning points or prayer, a bank, altar, and obelisk are located in this dungeon. Marvran is also available if you need new supplies or rewards. 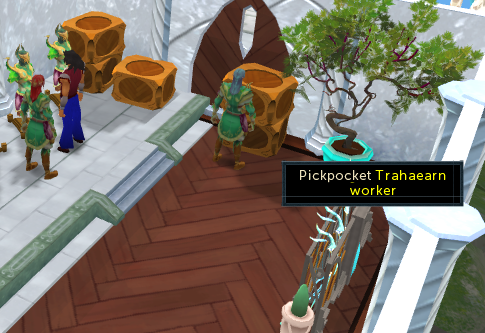 It is possible to pickpocket Iorwerth Workers if you have level 91 Thieving at least. You have the rare chance of stealing Frost Dragon bones, but for the most part you will receive ashes, weapons, food, seeds, or various bones. Some of the supplies you obtain from them may be useful in other clan areas. What makes pickpocketing these workers different is that you will not be stunned if you fail. Instead you will be spotted, and rendered unable to pickpocket from families of that clan area for a short while. Iorwerth Warriors (Level 122) can be fought, but not killed. When they reach their final life point, they will commend you on your combat ability and reward drops similar to thieving from Iorwerth Workers. 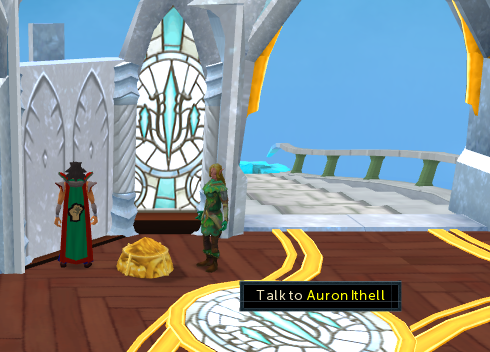 Crystal Locations: One is found west of Morvran and another is obtained while speaking with Lord Iorwerth about the Iorwerth Clan. The Ithell Clan is skilled in Construction, Crafting, and crystal singing abilities. There are crystal singers from other elven clans, but the most notable are from this one. 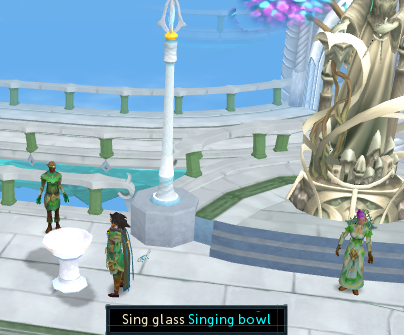 In this part of the city, a crystal singing bowl can be found. This is similar to the one in Brimstail's cave at the Gnome Stronghold. With this bowl, you are able to convert a small crystal seed into a crystal saw, crystal chime, or switch between either. The western part of the area contains a building with multiple uses. Two sides are a pottery oven. The north side is a cooking range. Across from this building is a machine for you to craft robust glass. The southeastern end contains two pottery wheels next to a well to collect water. The southern end of this circle provides a sand pit to gather buckets of sand while glassmaking. There are rocks in the west part of the city that contain Crystal-Flecked Sandstone which you can mine at level 81. 15 of these can be mined per day. You can craft these into crystal glass or crystal flasks with the use of a glassblowing pipe. The amount of crystal glass you can make from these is not limited, but the glass is untradeable. You do not need a certain crafting level to make the crystal glass, but will need at least level 89 to make the flasks which are tradeable. Combination potions can be made using crystal flasks by using the potions together with a flask in your inventory. The combined effects of the potions are mixed into a 6-dosed flask. To do this, you must have learned and unlocked the ability to make a certain potion. There are 20 different types you can make. If you would like more information on these, refer to the Herblore Guide, or the Meilyr Clan section which focuses on Herblore. Contrary to clay deposits, these rocks automatically provide you with soft clay when mined and offer more experience than clay. 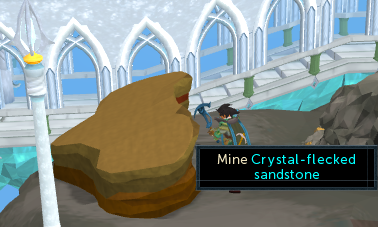 They are located directly across from the Crystal-Flecked Sandstone and can be mined if you have at least level 75 mining. Wearing a Bracelet of Clay will increase the speed of mining. With a grand payment of 1,000,000 gp and the existence of a Player-Owned House, you are able to set your home location to this new portal. This of course also gives you access to the eastern circle of the Ithell Clan via House Teleport. An Estate Agent is nearby to assist you. A sawmill operator will be present to turn your logs into planks and sell you both basic and upper-level Construction supplies. In the outer ring of the Ithell Clan, you will find crystal harps to make weapons for those with varying levels of smithing starting with level 75. You would fight monsters in Prifddinas to obtain crystal seeds as drops, play the harp to obtain harmonic dust, and combine the seeds and dust to make weapons. If you have at least level 75 Crafting, you may continuously play the harps to obtain crafting experience and crystal dust. Higher crafting levels will provide faster rates. You may find that a harp can go out of tune and provide less to eventually no experience or dust. If that happens, you will have to click on it to tune it. A crystal keeper will be nearby to hold your excess items while you continue skilling. Converting these two ingredients into weapons requires the crystal singing bowl in the center of the clan area or to add charges to existing equipment. This will cost money, however. The higher your level in Smithing, the less of a cost it will be. 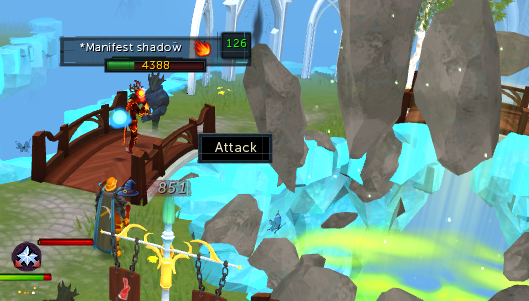 Attuned crystal gear cannot be recharged and will be destroyed once the charges are gone. Otherwise, running out of charges will return an item to its crystal seed state, to which it will need to be recharged. Crystal seeds are a flexible item, in which you do not have to recharge it into the same item. For example, if your crystal saw runs out of charges and returns to a seed, you can charge it into whatever other item you like. There are four different types of items you can possibly make. Each combat style possesses both one and two-handed weapons. Attuned weapons get stronger depending on your Agility level, but remember that they are destroyed when used up. Only when you are holding a crystal weapon in both hands, a 25% damage bonus is possible. Crystal tools (saw, fletching knife, hammer, tinderbox, chisel) are non-tradeable, but do not have any specific level to use. A +3 bonus is awarded to your level for a tool's respective skill. Crystal teleport items are also untradeable with no requirement to use other than manufacturing them. They can be tuned to a specific clan's outer ring and have four charges. These are different than the teleport crystals that take you either to Lletya or the Temple of Light in that they only have one destination, one that you choose. 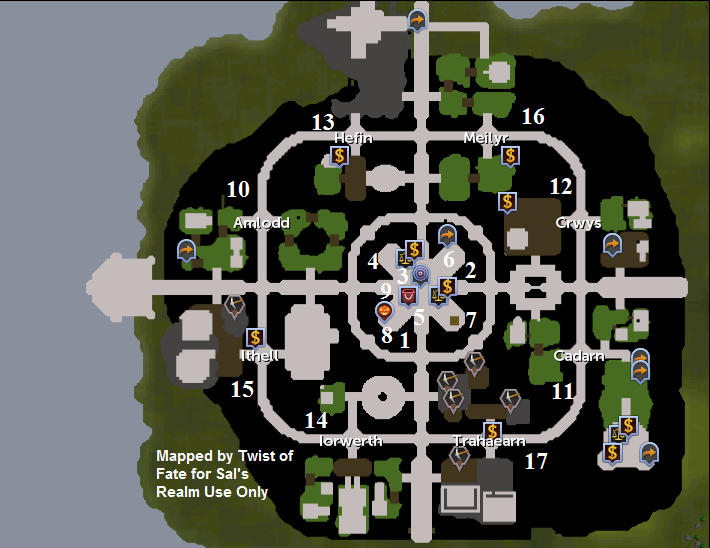 If you are at least level 92 in Thieving, you can pickpocket Ithell workers around the middle circle. You may obtain construction or crafting items such as seaweed, sandstone, and hides. Flasks and more expensive Construction supplies are rare rewards. Crystal Locations: One is found in the harp building, and the second is found while collecting a bucket of sand with 10 or more empty buckets in your inventory. 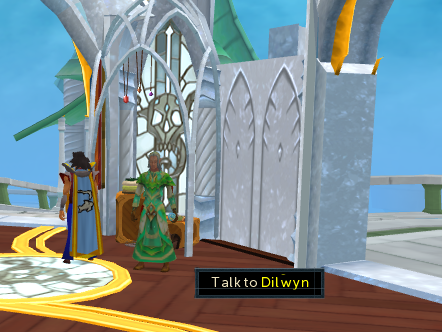 Meilyr Clan members are skilled in Dungeoneering and Herblore. A Dungeoneering Resource Dungeon has appropriately been placed in this area, giving a generous amount of experience if you have at least level 95 Dungeoneering. It is the host of two Runite rocks, Pawya and Grenwall hunting, an impling spawn, bank deposit box, and a bloodwood tree. If you have at least level 98 Thieving, you can pickpocket the Meilyr Workers walking around this area to receive secondary ingredients, dungeoneering tokens, seeds, or the more rare recipes. You will find four monoliths in this clan area. 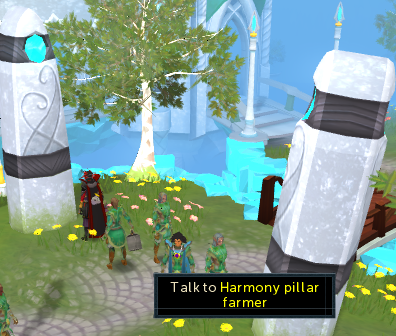 Buying Harmony Moss Seeds from the Harmony Pillar Farmer for 50,000gp (also available from trade) can allow you to plant moss onto these monoliths for players with level 75 Farming. Although the moss cannot get diseased, you can still tune your amulet of farming to monitor the growth. The moss does not grow over a set amount of time, but by going through one stage every time you've obtained 50,000 experience in any one skill. The monolith is tuned to one skill, so it would take 200,000 experience in that skill to go through the four growth stages. External experience gains, such as from quests, will not count, nor does bonus experience. The skills of which the monoliths are tuned to change every 24 hours, but the experience you've gained will be permanent. The four monoliths can be attributed to one skill at the same time, but the experience will only count toward one at a time. Between 1-5 moss are harvested each upon completion. The moss is stackable and tradeable and can even take part in making Juju Hunter potions. The outer circle of this clan holds a resource dungeon for more experienced players who have at least level 115 Dungeoneering. It will reward an even greater amount of experience than the former. There are also Meilyr Workers for higher-leveled thieves at level 98 and a Fruit Tree Farming patch. 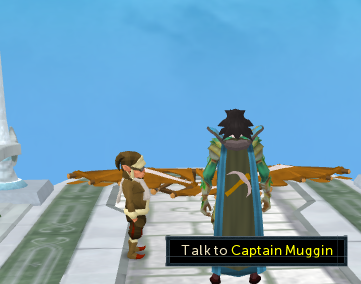 Captain Muggin runs the Gnome Glider in this location, at the northern edge of the Meilyr Clan. The Meilyr Herblore Shop, owned by Lady Meilyr to the north part of the area, offers recipes and combination potions for sale. Recipes allow you to combine the effects of different potions to create a new type, using the crystal flasks from the Ithell clan. There are 20 possible recipes. Seven of them are found while Dungeoneering. Once found, you will pay to unlock them from the store and you will permanently gain the ability to make them. 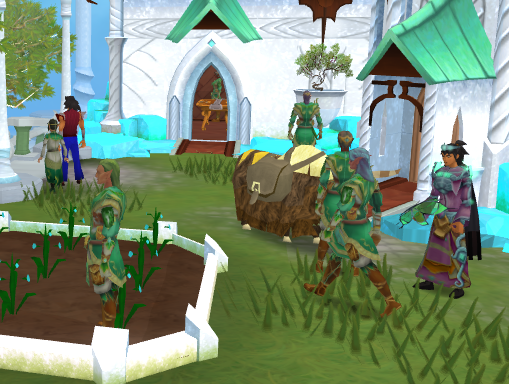 Across from Lady Meilyr's house, you will find a fruit tree patch owned by Alfon, with Emlyn performing the functions of the Tool Leprechaun. Crystal Locations: The first is found in Lady Meilyr's house, and the second is found while having a fully grown fruit tree in the Meilyr area, and harvesting harmony moss right after drinking a Perfect Juju Farming Potion. 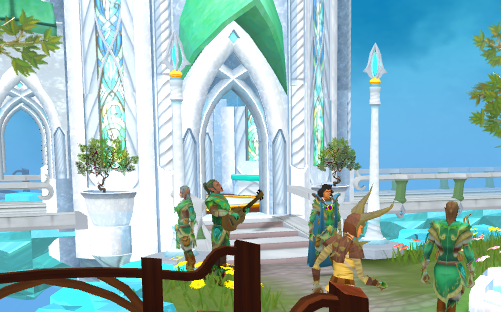 The metalworkers of Prifddinas, Trahaearn members are skilled in Smithing and Mining and led by Lady Trahaearn. Of course, there is access to a new mine with a nearby bank chest! The central area of this clan section contains a mine complete with 2 Rune rocks, 8 Adamant and Coal, 6 mithril, and 8 Gem rocks with a rare chance of receiving onyx, dragonstone, or summoning gems. 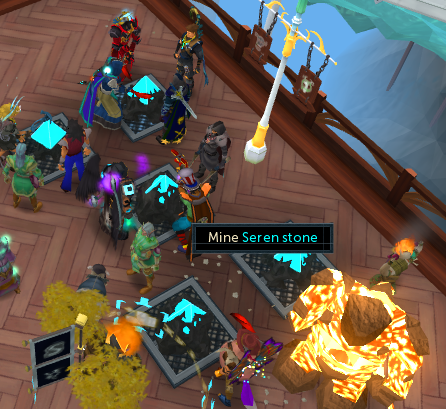 If you have level 89 Mining, you will be able to mine Seren stones. Rather than obtaining ore, you chip away the rock surrounding the crystal revealing a trapdoor which provides the crystal to the Hefin Clan and awards generous experience points. While mining these does not actually give you ore, you do have the chance of receiving an untradeable item known as "Corrupted Ore". If you have level 89 Smithing and take these to a furnace, you will be able to smelt them. No item is awarded, but you will be given a generous amount of Smithing experience without having to run back and forth to a bank. Just east of the Seren stone area, there is a Farming patch under the watch of Eifion with the help of Tewlip who can store your Farming supplies or teleport you to Winkin's Farm. If you have level 92 Thieving, you may pickpocket Trahaearn Workers to obtain mining items such as gems, bars, ores, and pickaxes. You may even receive rarer items such as concentrated ore or dragonstone. The outer circle is mostly dedicated to smithing. Here you will find 4 anvils, a furnace, a bank deposit box, and a statue to Seren. Crystal Locations: The first is found by searching one of the crates in the house directly south of the Seren Stones, and the second is found in the building with the Trahaearn Herald. 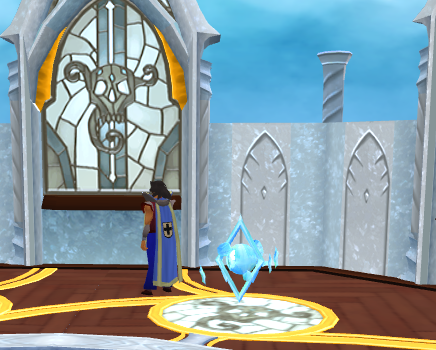 Every hour on the hour, two randomly selected crystal segments in the city will be endowed with the voice of Seren. Any region receiving this voice will find all experience multiplied by 1.2x. Chances of obtaining a golden rock are enhanced by double and there will be a higher frequency of crystal implings. Certain bonuses apply to different clans as well. For example, the Iorwerth clan endowed with the voice of Seren may allow you to obtain Slayer experience when killing Iorwerth Elves. If you have level 95 Hunter, you are able to catch Crystal Implings both in the city and the Puro Puro minigame. Rewards from these include tiny elf crystals, elder tree seeds, golden Elven shattered heart rocks, crystal acorns, and other crystal items. 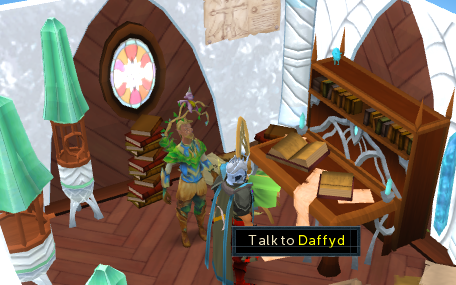 Be sure to talk to Daffyd in the Amlodd Clan to start building your log.